Lalonde Systhermique team works with the best parts and equipments available on the industrial market. When existing products do not meet our standards of performance, reliability and durability, we design and manufacture customized equipment. The role of a steam trap is to prevent steam from escaping in order to maintain the pressure in the heat exchanger while purging the condensate produced by this exchanger. In most cases, the pressure changes from the operating value (before the steam trap) to almost atmospheric pressure (after the steam trap). When the pressure at the outlet of the steam trap is higher than the atmospheric pressure, we say that there is a back pressure. This back pressure can have different sources. For example, it can come from the condensate that we want to push into a rising pipe or, again, it can come from the expansion steam. There is always a back pressure (a pressure in the opposite direction to the flow) to be controlled so that the condensate can flow through the steam trap. It is necessary for the operating pressure before the trap to be greater than the back pressure. The pressure difference between the two sides of a steam trap (called differential pressure ) is the driving force allowing the liquid to flow through this equipment. A sufficient differential pressure between the two sides of a steam trap is required for the condensate to pass through. If the differential pressure becomes too low, this may result in accumulation in the unit. While a small differential pressure is sufficient to ensure flow through some steam traps, other models require a much larger differential pressure to operate properly. It is important to know the characteristics of the steam traps and the steam system. The large difference in pressure that we find in the vast majority of steam systems is sufficient to push the condensate from its point of origin to a tank without using an electric pump. This is one of the basic principles of the Steam Condensate Closed System. The self-regulating diaphragm thermal trap has as its main operating element: a metal membrane filled with a mixture of alcohol and water. The diaphragm contracts when it comes in contact with condensate and relaxes in the presence of steam. When the amount of condensate is large, the membrane remains contracted so as to allow a continuous flow of condensate. In the presence of steam, the membrane closes. There are moments when the steam trap operates in continuous flow, when it operates intermittently (opening and closing under the influence of the temperature of the condensate) and other times when it is completely closed. The steam trap automatically adjusts to pressure variations. The self-regulating membrane thermal trap does not react as a function of the amount of condensate formed, but depends on the temperature of the condensate, which is an indirect measure of the amount of condensate formed. Indeed, the formation of condensate increases with the increase of the load of an apparatus. The greater the load of the appliance, the more condensate is formed. The temperature then decreases and the trap opens. The lower the load of the appliance, the more the condensate will get hot in small quantities to the trap and the more the trap is closed. There is no risk of accumulation, since the opening of the trap valve adjusts very quickly and precisely to the amount of condensate produced. There are different models of capsules for different applications depending the operating temperatures. In cases where the quantity of condensate produced is greater than the capacity of a single capsule, it is sufficient to use a model that uses more than one capsule. It is possible to install up to 9 capsules on a steam trap in order to obtain maximum condensation removal capacities with minimum space. 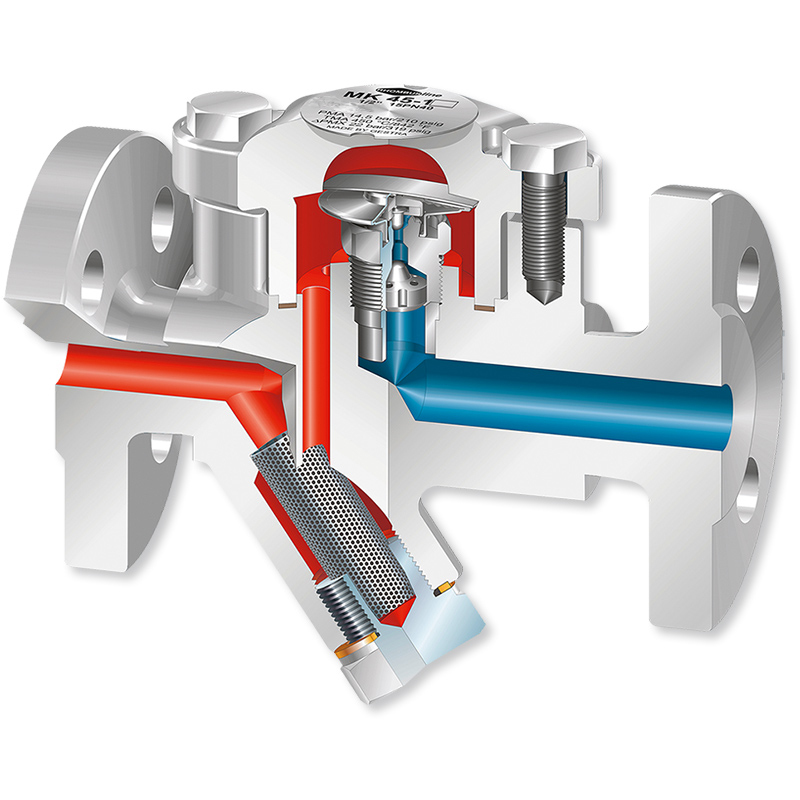 All self-regulating diaphragm steam traps allow automatic deaeration. This is due to the fact that the increase amount of air in the steam reduces the temperature without pressure drop. As the membrane of the trap reacts to the temperature, it opens to let the gas escape. This is an important advantage of this type of steam trap compared to other types. Depending on the membrane used, the condensate temperature is 9 oF (5 oC), 18 oF (10 oC) and 54 oF (30 oC), respectively, under the saturated steam temperature, regardless of operating pressure (0 - 320 psig). In fact, the curves of opening and closing of the membrane are adapted to the saturation curve so that the nominal temperature difference required to open and close the steam trap is almost the same over the entire range of operating pressures. The following figure shows a saturation curve, as well as the opening and closing curves of the three membranes. 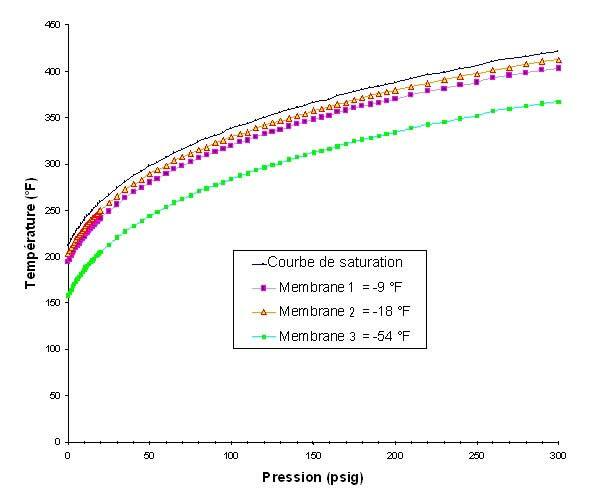 Operating curve of self-regulating membrane traps used by Lalonde Systhermique. This type of steam trap is therefore universal in the sense that it can purge a considerable range of condensate flow rates over a wide range of operating pressures. The opening and closing curves of this trap are perfectly adapted to the saturation curve of the steam over the entire operating pressure range. The small volume of fluid, as well as the large contact surface of the membrane, ensures a rapid response to the slightest temperature fluctuations in the condensate. This type of steam trap can be used with heat exchangers of all sizes. It allows automatic deaeration and is not affected by back pressure or corrosion. In addition, this steam trap is compact, which greatly facilitates its handling and allows installation in restricted areas. It can be installed in any direction. The parts are always the same, regardless of model and throughput, which simplifies inventory management and maintenance. The Self-Regulating Membrane Thermal Traps used by Lalonde & nbsp; Systhermique are unmatched in terms of quality and precision of operation. It is always profitable to quickly repair or clean a steam trap once a leak is detected. In steam systems where steam traps haven’t been serviced for 3 to 5 years, 15 to 30% of traps can be defective. The cost of a single leaking steam trap in a typical system can amount to thousands of dollars per year. It is important not to confuse flash steam and and steam leaks. We know that condensate going from a high pressure (before the trap) to a lower pressure (after the trap) partly vaporizes. We might be tempted to think that it is possible to evaluate a steam trap discharging into open air by examining the plume of steam at the trap’s outlet. However, this method is not reliable because it is impossible to distinguish between flash steam and live steam. That said, if we are very familiar with the normal appearance of the plume that comes out of the steam trap, an increase in the size of that plume can be a visual indication that the steam trap is not functioning properly. In a closed system, since steam traps don’t discharge into open air, it is impossible to draw this kind of conclusion. On the other hand, an increase in pressure at the dearator can be a sign that one or more steam traps are leaking. A temperature decrease in a heat exchanger can result from a clogged steam trap: since condensate cannot be evacuated by the trap, it accumulates in the exchanger, which causes the decrease in temperature. In any case, when a steam trap malfunction is suspected, it is necessary to test the trap objectively before drawing any definitive conclusion. Steam leak detection is made with the assistance of a special device designed to detect ultrasounds generated by a leak in a trap. A steam leak in a trap generates a very specific whistling noise that the human ear cannot detect. The leak detector is designed to to measure these ultrasounds and indicate if there is a leak. It is important to use the detector properly in order to avoid erroneous diagnosis. A leak detector can detect external noises if the noise level is very high in the area surrounding the trap. This can lead to a bad diagnosis. 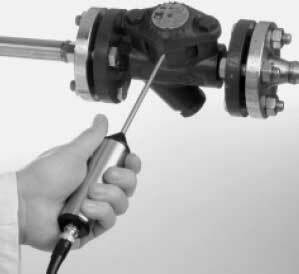 Whenever possible, it is preferable to test steam traps at a time when the noise level is lower. A working steam trap that receives a lot of condensate produces ultrasounds that can be interpreted as a leak by the detector. Steam makes this noises as it flashes in the trap. It is thus important not to test traps during system start up, at a time when traps have a lot of condensate to eliminate. It is better to test traps once the system has stabilized. A leak in a steam trap that receives a lot condensate is not necessarily problematic since a trap full of condensate doesn’t allow steam to escape. The impact of a leak in this kind of situation is minimal as long as the load is high. If the load in the exchanger varies and becomes almost nil, then the leak will become important and the detector will be able to measure it. In order to verify a steam trap’s ability to open, it is necessary to test the trap under full load. Ideally, we must then test the trap under no load in order to determine if the trap closes correctly. End of lines are often used for that purpose. Cleaning of steam traps requires a specific technique. Our team offers a complete cleaning service on all steam traps installed by Lalonde Systhermique. Parts are subjected to special acids that remove iron particles stuck to the stainless steel. In cases where capsule is clogged by oily matter, a solvent is used. Each capsule is then evaluated individually on a test bench under steam pressure. Bad capsules are identified and returned to the owner. Plants often use a great number of steam traps and it happens that the existence of some of them becomes forgotten about, especially if they are in poorly visibles locations. It can also happen that some of them are skipped during maintenance rounds. In order to insure the perennity of the system, each steam trap must be identified with a tag that is robust and highly visible. Once steam traps are tagged, they must be recorded on a location plan. Following major works in a plant, we discovered steam traps hidden between two walls – there was no location plan to indicate their presence to the maintenance team and consequently they hadn’t been serviced in 10 years. The steam traps had been leaking for at least 5 years and steam was getting out of them at full flow rate. Imagine the costs associated with this kind of situation! A well-conceived location plan makes it easy to quickly locate any of the plant’s steam traps, making this kind of incident unlikely. The location plan facilitates planning and execution of adequate maintenance operations. 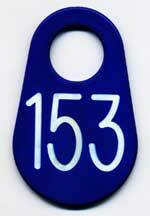 The last element of a good maintenance strategy consists in keeping a technical record of steam traps. This record is in fact a list that specifies the brand, the type, the model, the size and the date of installation for each steam trap. The technical record also contains maintenance instructions (required tools, spare parts, etc.) as well as a technical sheet for each type of trap.